Noted author and cynic Ambrose Bierce once described his former Civil War commander, Brig. Gen. William B. Hazen, as 'the best-hated man' in the American Civil War. He meant it as a compliment. In the course of his 30-year military career, Hazen managed to quarrel with various superior officers, up to and including the president of the United States. He was reprimanded, court-martialed, and removed several times from command, only to be restored when political allies such as Rutherford B. Hayes and James A. Garfield entered the White House. His courageous testimony in the trading post scandals surrounding Secretary of War William Belknap resulted in the secretary’s resignation in disgrace but earned Hazen the lasting enmity of Belknap’s patron, President Ulysses S. Grant, and Grant’s minions, including Generals William T. Sherman, Phil Sheridan, and George A. Custer. It was all in a day’s work for the contentious Hazen. A native of Vermont, Hazen graduated from the U.S. Military Academy at West Point in 1855. He served against Native American warriors in Oregon and Texas, and he carried a Comanche bullet in his side for the rest of his life after being shot in an ambush in 1859. 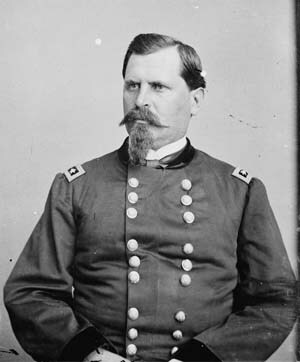 With the help of his boyhood friend, then-Congressman James A. Garfield, Hazen was appointed a colonel in the Union Army in November 1861. He subsequently saw severe action at Shiloh, Perryville, Stones River, Maj. Gen. William T. Sherman’s Georgia campaign, winning a brevet promotion to major general of volunteers at the war’s close. Following the Civil War, Hazen saw service in the Plains Indian wars, commanded the allblack 38th Regiment in New Mexico, was an official observer of the Franco-Prussian War, and served as military attaché to the U.S. legation in Vienna, Austria, before becoming head of the U.S. Signal Corps in 1880. Trouble was never far from Hazen’s door, and he became embroiled in a decades-long controversy with fellow Union general David S. Stanley over their respective roles at the Battles of Shiloh and Stones River. After Stanley publicly accused Hazen of “disgraceful conduct,” Hazen sued Stanley for libel. An unprecedented joint court-martial found Stanley “guilty of conduct to the prejudice of good order and military discipline.” Charges against Hazen were dropped. Hazen next quarreled with Secretary of War Robert Lincoln, Abraham Lincoln’s son, over a failed exploring expedition to the Arctic Circle, which resulted in death of 17 American soldiers. Hazen accused Lincoln of bungling the rescue mission and went public with his complaints, eliciting a formal reprimand from President Chester A. Arthur for “unwarranted and captious criticism” of Lincoln. Many of his fellow officers privately supported Hazen’s view of the younger Lincoln. Before he died in 1887, Hazen told his side of his controversial career in a wellreceived memoir, A Narrative of Military Service. His old Civil War aide, Ambrose Bierce, was particularly pleased to find a reference to himself in the general’s memoirs. Bierce, wrote Hazen, was “a brave and gallant fellow.” Bierce, who did not like many men, shared the feeling. Tags Abraham Lincoln, Ambrose Bierce, David S. Stanley, Franco-Prussian War, general george armstrong custer, Indian Wars, Perryville, Shiloh, Stones River, Union Army, US Signal Corps, West Point military academy, William B. Hazen, William T. Sherman.